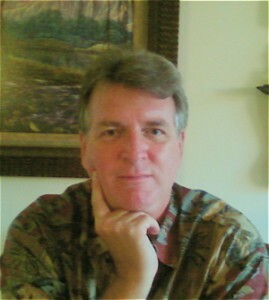 David Haggith is the publisher/editor-in-chief of The Great Recession Blog. My path to writing this blog began as a personal journey. Back in 2007, my (now ex) wife had a family home that was an inheritance from her mother, which she and her brother had been holding onto for several years because real-estate was always appreciating. I worked as a resort property manager back then, and I was certain from my own observations in the industry and from my readings that the U.S. housing market was on the verge of catastrophic collapse. Even though real-estate agents I talked to thought I was nuts, I urged my wife to press her brothers to sell the family home before prices collapsed. They eventually complied and sold the home just three months before Bear-Stearns made it obvious some deep financial troubles were brewing, taking the U.S. housing market down for the tumble. Her family sold near the peak of the market. I realized, then, the value of urging people to take actions based on what I believed would happen. Why should I have known the housing market and banks would crash when Al Greenspan, Ben Bernanke and the Federal Reserve board members clearly did not? When I watched with dismay as the Fed and government bailed out all the banksters who brought collapse upon the entire world and at how the Bush government believed everything FED to it by the very people who never saw the collapse coming, I couldn’t stop myself from writing a critical series I called “Downtime“, which lampooned the U.S. government and chided the Federal Reserve for their greed, cronyism, ignorance and ineptitude. Heck, Bush put the very people who created the mess in full charge with blank checks to solve the mess! It was insane! I syndicated those articles on my own to The Hudson Valley Business Journal, The Valley City Times-Record (North Dakota), The Daily Herald (Tennessee) as well as a news website in Israel and another in Australia. As Bush claimed that he had to give up his capitalist principles to save capitalism, I realized all he was really saving were fair-weather capitalists who became socialists as soon as their profits turned into losses. (Hoard the profits to themselves, but socialize the major losses.) The government even helped them pay themselves fat bonuses for breaking their banks! We wrote about how quantitative easing would just inflate another huge economic bubble in housing and stocks due to the huge blasts of baseless money the Fed was pouring into banks, and we watched as that became, indeed, exactly where all the money went and where all the inflation from money-printing was happening. We wrote about how none of that would trickle down to increase the wealth of the average person but would make banksters and barons of industry obscenely richer. It seemed like almost no one was writing critically against these things. As each round of quantitative easing failed to deliver a sustained recovery and required an even bigger round of QE, I wondered why I could see from the beginning that it would turn out that way and none of the brains on Wall Street could. None of the popular financial writers seemed to see that each round QE would not create a lasting recovery. Eventually, I realized they didn’t appear to want lasting recovery; they wanted lasting recovery EFFORTS, because those efforts were making them richer faster than the real economics of manufacturing things ever had. That’s when I decided to start writing The Great Recession Blog. I decided the world apparently needed a voice that would present more insightful commentary on the economic news of the day than what had been available anywhere in the mainstream media. That was based less on high thoughts about my own intelligence than on amazement at how no one else seemed to see through ALL of this nonsense. Maybe I did simply because I don’t wear rose-colored glasses for myself or anyone else and I don’t associate with any political party. Party politics keeps people blaming the other side and never seeing the flaws in their own party’s solutions. I’m not an economist by training, but we’ve been inundated throughout the years of the Great Recession with commentary by celebrity economists who have missed the mark every time with their own economic predictions. I have minced no words in the many years that I have now been writing this blog. I bring as much disrespect to bankers, economists, commentators, and politicians as their cerebral stem rot and corruption deserves. Don’t expect me to tread lightly on your favorite politician when the mess we have now is worse than what we had a decade ago when the mess began. Along the way, I predicted the end of the bull market would begin in the fall of 2014, which was when the Fed said it would start terminating its final round of QE. To my satisfaction, it did. 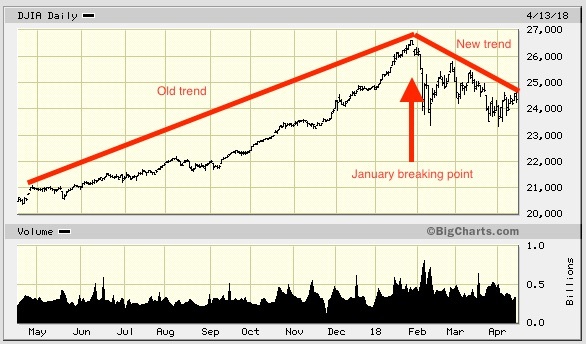 While others would say the bull market continued because no bear market happened at the point, I’d point out that for the next two years the stock market did nothing but pitch up and down on big waves along a horizontal track. If you exited the market (as one who normally buys and holds) in December of 2014, you could have bought back in at the end of October, 2016, at the same price. The only thing that finally pulled the US out of that trip to nowhere over hugely stormy waters was the election of Donald Trump. 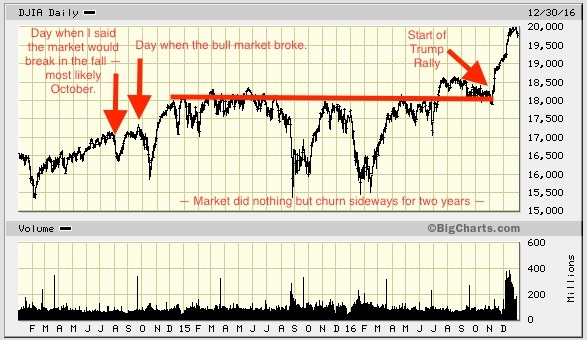 Had that not happened, the market would have fallen, and 2014 would have been its last high. Too many criminal CEOs still fill their porky bellies at the expense of other taxpayers as massive tax benefits help them and hand out crumbs to the middle class — just enough to keep the masses happy because they have a little more jingle than they did before. The tax breaks are not paying for themselves, so this corporate welfare is breaking the US financially now. The US government has turned trillion-dollar deficits into the new norm as far as the eye can see. We did this under an entirely Republican-led government after Republicans claimed for years to be the only deficit hawks, the only politicians with fiscal rectitude. So much for proving the lie. The truth is that both parties are willing to spend the US broke, but just on different things. You’re choice is the Welfare Party or the Warfare Party. If you think the US is doing better, just remember that its easy to throw a big party when no one is paying for it because you’re buying it all on the company credit card. So, yeah, stocks took a big ride up on the hope of tax breaks in 2017. As we went on that ride, I predicted in the middle of 2017d that the bull market would break in January of 2018. It did. (See chart above.) 2018 turned out to be a year when stocks, again, did nothing but plunge up and down on huge waves on a ride that ultimately went nowhere. It bounced sideways deliriously even in a year when profits that had accumulated abroad for years were being repatriated all in one year at lowered tax rates and when most of that money was being pumped into trying to boost stock prices by offering higher dividends and by repurchasing company stocks with the repatriated company cash. I also predicted the stock market and economy would get much worse in the fall of 2018 because that is when the Federal Reserve would begin to reduce its balance sheet at its top promised speed — something I’ve referred to here as “The Great Recovery Rewind.” Sure enough, an October surprise caught investors off guard and took the market back on a perilous journey just like the trip we began in 2014. Because we endlessly repeat these cycles with everyone defending their politician of choice and blaming the other party and no one in government dealing with the fundamental flaws in our economy (go back and read earlier in the blog to hear what those are), I thought about quitting the blog at the end of 2018. Some dedicated readers volunteered time and financial support if I would continue, so I’m continuing for the time to see if support builds and because I think we are entering times when it will become obvious that neither Trump nor the Federal Deserve (because we deserve it if we keep it after all that has happened) has delivered a sustainable recovery from the Great Recession. We are now entering the Second Great Recession. GR 2.0 is really the same recession after the Fed’s artificial life support has been removed, which I have claimed we would fall back into from the start of my economic writing a decade ago. It was such a great recession for the top one percent that we’ve decided to do it all over again.